"Refinish your existing metal, steel, aluminum, porcelin, ceramic, acrylic & formica"
The basic law of electricity states: opposites attract. This is the basis of electrostatic painting. The item to be painted is given a negative charge, and the paint is given a positive charge. 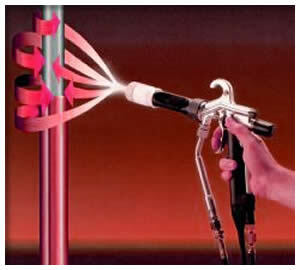 The paint is then atomized through a special round revolving nozzle. © Copyright Electro-Glo of Wisconsin, Inc. Electrostatic Painting Services. All Rights Reserved. Mukwonago, Muskego, New Berlin, Oconomowoc, Pewaukee, Sussex, Wales, Waukesha and the surrounding areas.